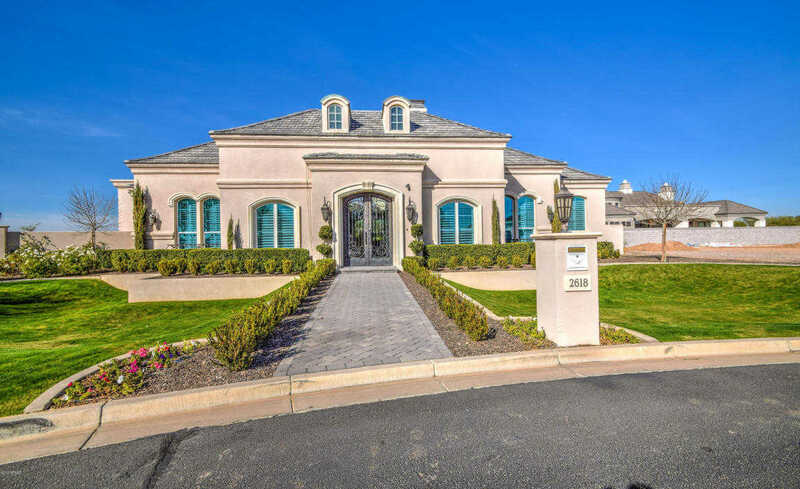 Unequalled luxury in one of Gilbert’s finest neighborhoods awaits in this stunning French country inspired home. You know you are in a special place as you pass through the double iron door to find dsigner ceilings and oversized French doors to the Italian villa courtyard. Every room you enter is adorned with simple elegant luxury. The designer’s opus; his hand painted touches in many places confirm that one of a kind feeling.. 3 incredible suites each with its own unique ceiling and style, each bathroom with its own unique luxury. Impossible to describe – gourmet kitchen, limestone fireplaces, barn wood accents, brick treatments/wood floor. Opulent outdoor space; huge pool, sport court, putting green,+amazing detached RV with game & guest. One bedroom currently being used as an office. Approximate size: 29707.00 sq. ft. Please, send me more information on this property: MLS# 5800648 – $2,495,000 – 2618 E Kingbird Court, Gilbert, AZ 85297. I would like to schedule a private showing for this property: MLS# 5800648 – $2,495,000 – 2618 E Kingbird Court, Gilbert, AZ 85297.